A while ago... I'm guessing over a year and a half... I recall a reader emailing me with a request for a post about a bicycle culture tiny detail in Copenhagen. The little hook thingy found on most back racks. It's a practical solution to a question that arose about a century ago. 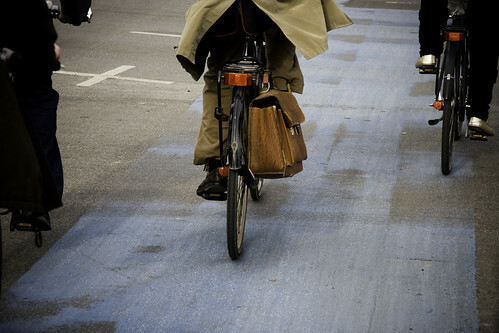 How to transport your briefcase on your bicycle? While I'm quite sure this isn't a uniquely Danish thing, it does however seem to live on more in Denmark than elsewhere. The Dutch evolved a culture for using pannier bags while the Danes preferred the basket. Not many men used a basket and for the better part of a century, briefcases were what men carted around. In the style of the one in the above photo. Soft leather. Widespread use of these briefcases - I'm making a qualified guess here - faded away in the late 1960's. When the grassroots movement to reinstate the bicycle on the urban landscape started in the mid-70's it was borne, by and large, by the flower power culture of the 1960's and the briefcase was something for 'businessmen'. Anyway, these briefcase hooks are still widespread. I had a look at the bicycles in the four bike sheds the people in our buildings use and there were many back racks with hooks. I've been seen to use them when transporting diapers home from the supermarket. 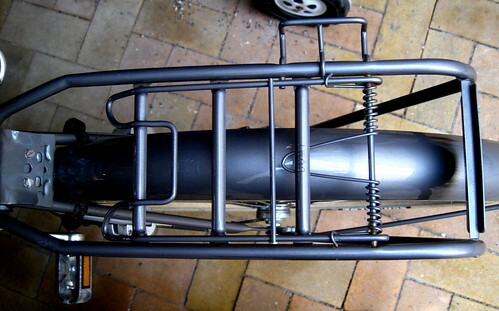 Here's my bicycle, the Velorbis, with the back rack hook thing. A little metal pin, which rises up when you lift the rat trap, holds the strap of the briefcase, or whatever you're carrying, in place. A simple little design addition from Bicycle Culture 1.0 carried on well into Bicycle Culture 2.0.